The exhibition SuperSub – on collectivism is part of the annual culture event IMAGES – a collaboration between Center for Kulturel Udvikling (CKU) and several Danish cultural institutions. The goal with the exhibition at Den Frie is to make an exchange of experience between Den Frie and non-Western artists, curators, and institutions, as an alternative to the traditional view on art in Denmark. Den Frie welcomes an institutional context and artistic platform that expands and challenges an “international” (read: Western) view by presenting a “global” point of view. Therefore the artist and curator Ade Darmawan from Indonesia has been invited to curate the exhibition for which he has selected five artists, who are all involved with collective art practises. With this overall concept around experience and cultural exchange between a number of Copenhagen based artist groups, curators, and non-Western institutions, it is our wish to raise the questions: What does it mean to work collectively today? What lies hidden in the community and in the collective culture production? The participating artists are: Reza Afisina, Mg Pringgotono, Mahardika Yudha, Arief Yudi, Andreas Siagian and Farid Rakun. I’m presenting my collection of tiger documentations that I collected in my tumblr as part of a group exhibition called 125,660 Specimens of Natural History in Komunitas Salihara. The work titled: Loreng: Kisah dari jejak citra Harimau Indonesia. During DA+C Festival 2015 in Penang, I was involved in a project called Warung Wayang which is curated by Fairuz Sulaiman. [instrument | installation] Nadalaut: As Above So Bellow for Instrument Builders Project – NGV, Melbourne, AU. A collaboration with Dale Gorfinkel. 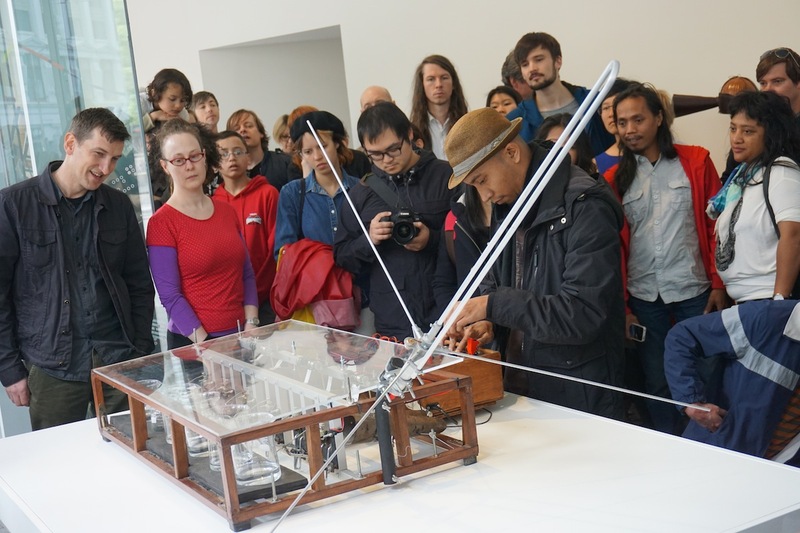 During 1 – 23 November I participated as exhibiting artist in The Instrument Builders Project Exhibition at National Gallery of Victoria, Melbourne Australia. This exhibition presents selected works from the two iterations of the project done in Yogyakarta. Exhibiting artists in this exhibition are: Peter Blamey, Mas Wibowo, Michael Candy, Caitlin Franzmann, Dale Gorfinkel, Jompet Kuswidananto, Dylan Martorell, Andreas Siagian, Wukir Suryadi, Tintin Wulia, Asep Nata. Mountain Operated Synth (MOS) a collaboration with Michael Candy (AU), Pia Van Gelder (AU); along with Glassbell a collaboration with Asep Nata and me are two collaboration works that was selected as part of the exhibition. . More information about can be found in IBP website [[>>here<<]].